Apple announced this morning that the 100 millionth iPod has been sold, making the iPod the fastest selling music player in history. The first iPod was sold five and a half years ago, in November 2001, and since then Apple has introduced more than 10 new iPod models, including five generations of iPod, two generations of iPod mini, two generations of iPod nano and two generations of iPod shuffle. 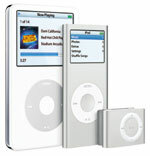 The iPod has also led to an “iPod economy” of over 4,000 accessories, ranging from cases to speaker systems to iPod vibrators and iPod toilet paper dispensers. More than 70 percent of 2007-model US automobiles currently offer iPod connectivity.